Is Renting an Industrial Shredder Really Your Best Bet? 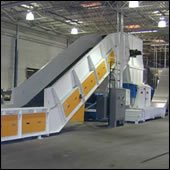 While it may seem ideal to rent an industrial shredder for a shredding purge every once in awhile or even annually considering their ability to chew through nearly 20,000 pounds of paper per hour, industrial shredders are far too large to fit through an office door and would create more shredded paper bits than you would know what to do with. On top of this, these heavy-duty, industrial-grade machines are incredibly expensive, and just renting one can be quite costly. Not only would just the flat rental fee for an industrial shredder be steep—you would also need to pay an employee just to sit there and continually feed the documents one by one into the shredder all day, meaning that in addition to the money you pay just to do your much-needed shredding, you still have to pay just to do all the work yourself. Instead, Shred Nations has not just one, but several easy and cost-efficient alternatives to making the costly investment of renting an industrial shredder. Here, we explore other shredding options which include convenient mobile shredding, cost-efficient offsite shredding, or even community-benefiting shredding events. Rather than just renting a standalone industrial paper shredder, at Shred Nations our shredders are built into commercial box trucks, running off the power of the diesel engine that drives them. Combining the power of an industrial shredder with the mobility of a truck, we have the capability to come directly to our customer’s curbside, shredding your documents in the truck right there as you watch for ease of mind, or picking them up to be transported for shredding with thousands of other documents at one of our secure offsite shredding facilities. Simply submit a free quote request by either filling out the form to your right or giving Shred Nations a call at (800) 747-3365. After speaking to one of our shredding experts, we’ll connect you with local mobile shredding companies who will provide you with free quotes for your shredding project. After selecting the ideal shredding company to match your location, budget, and project size, we deliver locked shredding bins to your home or office location for you to securely store documents. You fill up the bins with everything that needs to be shredded. 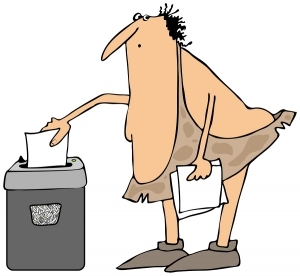 When the bins are full, contact your local mobile shredding provider to set up a time to come shred your documents. Our trucks arrive equipped with an industrial shredder built-in to turn your paper to bits and mix it in with tons of other paper for even greater security. You can watch the entire shredding process, where our shredding professionals never come in physical or visual contact with your documents. Once your shredding is complete, we provide you with a formal certificate of destruction to provide proof of when and where your shredding was done, as well as guarantee that your shredding was compliant with all FACTA and HIPAA regulations. Besides just our industrial shredder trucks, we also offer several other shredding alternatives that can help to get your sensitive documents shredded with an industrial efficiency. If you are still hoping to shred and dispose of your documents with the speed of an industrial shredder but the cost of renting one is a deal-breaker, you can also consider adopting offsite shredding services. 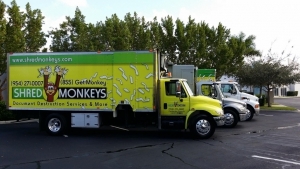 Similar to mobile shredding services, we use our industrial shredding trucks to come to you, collecting your sensitive documents from locked shredding bins before we transport them to one of our secure offsite shredding facilities. For large-scale shredding projects that you might otherwise want to use an industrial shredder for, offsite shredding services are hailed as the most cost-effective shredding option, as the only time we’ll spend at your location is to simply collect and load your documents. Rather than renting a shredder or hiring a shredding service to destroy your documents on site, you only pay for the shredding service to make the trip to your location for pickup, driving shredding costs vastly lower. If your company or organization is interested in renting an industrial shredder for the purposes of organizing a one-time or annual shredding purge for employees or members, you may also want to consider the possibility of organizing a shredding event, which benefits not just your employees, but also the larger community as well. 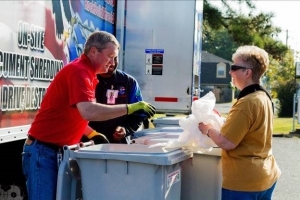 Besides being a convenient opportunity for your employees to securely shred their documents, community shredding events can also offer a unique opportunity to avoid the heavy cost of renting an industrial shredder, as it is common for shredding services to view shredding events as public service opportunities, and as a result donate their services for free. In addition to the shredding benefits from hosting, a well-orchestrated shredding event can also be used as a perfect promotional tool for a business by helping to put their name out into the local business space—making a shredding event yet another efficient strategy to opt for as an alternative to making the steep investment in renting an industrial shredder. Although document shredding is a critically essential part of any secure business practice, why should you pay to rent a document shredder just so you can do all the work yourself? At Shred Nations, we specialize in using our nationwide network of shredder providers to help you find the ideal shredding service for your project size and budget. With a wide range of convenient and cost-efficient shredding services to choose from, we’re confident we can help you to avoid the unnecessary cost and difficulty of renting an industrial shredder for only a few hours’ work. To get started with any of the various shredding services we offer, just give us a call at (800) 747-3365, or simply fill out the form to your right to request free quotes on alternative shredding services today! A Guide to Proper Data & Document Destruction: While there are several ways to manage your documents and data, there are also several ways of properly shredding and destroying your sensitive documents and electronic media as well. With this in-depth white paper, we explore the ins and outs of document destruction policies, covering proper destruction methods, managing risks, and more. How Much is Mobile Shredding: A convenient and cost-effective option compared to most other shredding options, mobile shredding allows a shredding professional to come to your location and shred all your documents on site. Use this article to help you get an idea of how much paper you have and what it might cost to have it destroyed using mobile shredding. Hosting a Community Shredding Event: A How-To Guide: A shredding event provides a great opportunity for the members of a community to come together—securely shredding their documents while also helping to promote a safer and more informed community. In our in-depth white paper we walk you through the steps to setting up a shredding event, gathering volunteers, promotion, and more!